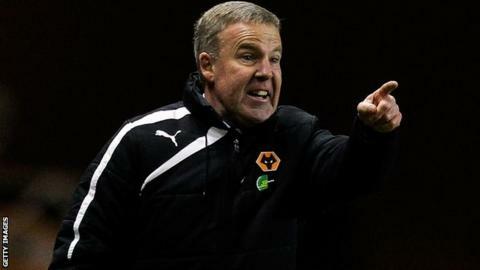 Wolverhampton Wanderers boss Kenny Jackett has accused his side of lacking an "appetite" for success. Wolves dropped one point behind League One leaders Leyton Orient after Saturday's 2-0 home defeat by MK Dons. "It doesn't look like the appetite is there at present. They showed more hunger and desire than we did," 51-year-old Jackett told BBC WM. Before back-to-back defeats to MK Dons at home and at Peterborough, Wolves had taken 27 points out of a possible 33 since losing at home to Walsall on 17 September. "Appetite, running and hunger wasn't there, and those basics always go before any ability that is shown." After demanding more goals from his side in the build-up to the game, Jackett made an example of leading scorer Leigh Griffiths and winger Bakary Sako, substituting the influential duo at half-time. "I don't think their work rate was enough in the first half," Jackett said. "They have to start better than that at home, with a better appetite, and that ran right through the side. We didn't match that from start to finish"
Having lost successive league games for the first time this season, former Millwall, Swansea and Watford boss Jackett has demanded his side bounce back strongly at Rotherham on Saturday. "We have to respond in the right way," he said. "We've lost to Peterborough and MK Dons, it's happened and we have to learn our lessons. We need to come out fighting in the next game."